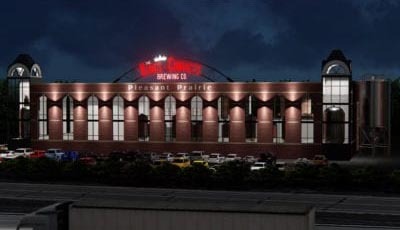 Development plans to be considered by the village of Pleasant Prairie call for a new high-end hotel and a brewery just south of the Interstate 94 interchange with State Highway 50. On Monday evening the village’s Plan Commission will consider a master conceptual plan from Branko Tupanjac, the owner of 7.4 acres of vacant land at 7821 120th Avenue, for the development of two commercial buildings and related site improvements. According to a village staff report, the northern lot at this site would be developed as a hotel with a banquet hall and restaurant. On the southern portion of the property would be built a new Kings & Convicts brewery and restaurant. The development site includes 1.7 acres being purchased from the Wisconsin Department of Transportation.